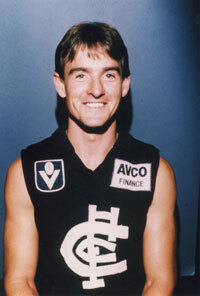 Michael John “Mick” Kennedy played honest football for more than a decade at Carlton, highlighted by his inclusion in the Blues’1987 Premiership team. A late developer, he seemed to be still at his peak when he was controversially sacked on the verge on the 1990 season, and found his way to Sydney. Like a number of fellow Carlton players of that era, Kennedy hailed from Melbourne’s northern suburbs and learned his football at St Mark’s College in Fawkner. In 1975 (aged 11) he experienced the thrill of donning the CFC monogram for the first time as a member of the Blues’ Little League side, before eventually progressing through to Under-19 and Reserves level. On Saturday, September 1, 1984, Kennedy became only the second individual to wear Carlton’s guernsey number 55 into a senior match when he made his debut against Sydney at Princes Park. For two seasons he had impressed as a free-running ruck-rover at reserves level and deserved his promotion, but in a one-sided game he sat on the interchange bench for long periods as the Blues won by six goals. Omitted after that one game, Mick resumed with the seconds and enjoyed a good finals campaign that culminated in a wild and willing Grand Final against Melbourne. Fights erupted even before the first bounce, and a total of 8 players were reported by the umpires on 16 charges, as the Demons triumphed by 36 points. In 1985, Kennedy switched to the number 43 guernsey previously carried through 263 games by David McKay. He was selected in another two senior matches early in the year, but from then cooled his heels with the seconds right through to a second-successive Grand Final loss - this time to Hawthorn. Twelve months later, Mick’s future was under a cloud. Although he experienced the elation of a Premiership at last when Carlton’s seconds demolished Footscray in the ‘86 Grand Final, he had played just three more senior games over the year for a career total of six, and the end-of-season player cull was looming. The axe was extra-sharp too, because deficiencies in Carlton’s list had been laid bare when the seniors had been thrashed by Hawthorn in the flag decider. Happily for him and for Carlton, Kennedy not only survived the cleanout; he hit his straps in 1987 and became a regular senior player, with versatility as his trademark. In his ninth senior game – against Essendon in round 5, he kicked the first two goals of his career, as he adapted to the role of an impact player from the interchange bench. Then in September, he ruck-roved alongside Justin Madden in the second Semi Final, when Carlton toppled Hawthorn at Waverley to qualify for another crack at the Hawks for the Premiership. In searing heat on Grand Final day, Carlton sprung some surprises when the teams lined up, sending defender Jon Dorotich to full-forward, wingman David Rhys-Jones to centre half-back, and Kennedy to the forward pocket in a defensive role on Hawk playmaker Russell Greene. All of these changes (and others during the game) clicked, and the Blues demolished their rivals by six goals to claim a glorious 15th flag. From then on, Kennedy played almost exclusively in defence. He manned the back pocket in Carlton’s shock defeat by Melbourne in the 1988 Preliminary Final, and contributed another consistent season in 1989, although the Blues fell off the pace and missed the finals. That was bad enough, but Carlton’s troubles were also compounded by salary cap pressures, and the abrupt sacking of Kennedy and ruckman Michael Gallagher in March 1989 was a huge surprise – especially because both were regular senior players and popular around the club. It didn’t take long for the pair to find new homes. Gallagher was snapped up by North Melbourne, and Kennedy went to Sydney, although he was to add only another 15 games to his career total before retiring a few months short of his 27th birthday. The best indication of the quality of those 15 games was his third placing in the Swans’ Best and Fairest. In the years after his retirement from AFL football, Kennedy returned to Victoria to play and coach at a number of country and suburban clubs, including Frankston, Dandenong and North Ballarat. Before Kennedy, the first Blue to wear guernsey number 55 in a senior match was Mark Buckley, who played 4 games in 1982. Contributors to this page: molsey , Grisdesa , PatsFitztrick , Bombasheldon , true_blue24 , Jarusa , WillowBlue , nikki and admin . Page last modified on Thursday 11 of October, 2018 17:35:04 AEDT by molsey. 1980 1st Semi - Alex Marcou the acrobat. 1983 Rd 14 - Buckley & Raines.